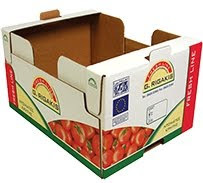 Visitors to Fruit Logistica 2010 in Berlin can request quotes for and samples of fresh produce packaging from INDEVCO corrugated manufacturing plants before the show. Unipak Nile and sister companies, Unipak and Easternpak, will exhibit their agricultural packaging products at Fruit Logistica 2010 from 3 - 5 February 2010 in Hall 2.1, Stand #C-07, in Berlin Exhibition Grounds. Fruit Logistica is the world's leading trade fair for the fresh produce industry.